Free Shipping Included! L.T. Wright Handcrafted Knives Camp MUK A2 Flat Canvas Python Handle by LT Wright Handcrafted Knives at Sara Stage. MPN: CAMP-MUK-A2-F-CANPYT-M. Hurry! Limited time offer. Offer valid only while supplies last. L.T. Wright Handcrafted Knives Camp MUK A2 Flat Canvas Python HandleThe L.T. Wright Camp MUK is a modern version of the Nessmuk style of knife blade. The L.T. 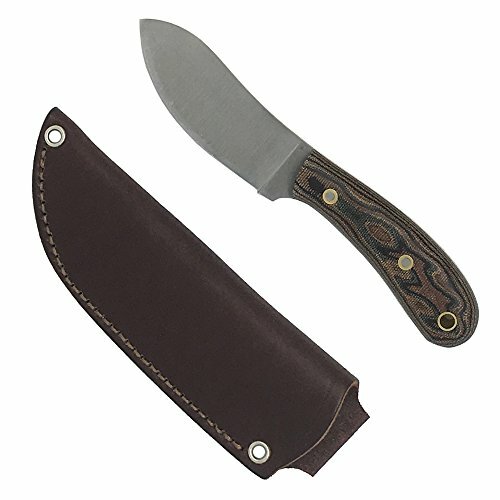 Wright Camp MUK is a modern version of the Nessmuk style of knife blade. It excels at slicing and skinning chores. While an excellent slicer, the Camp MUK also handles other outdoor tasks encountered while hunting, hiking and camping. The blade edge starts curving at the ricasso area so there is plenty of "belly" for slicing chores. This heavy duty knife features A2 tool steel, a squared spine for firesteel use and a large lanyard hole. The handle is shaped very nicely for comfort during times of extended use. The handle scales are attached with "fisheye" boL.T.s and two ton epoxy for a lifetime of trouble-free use. • Overall Length: 7.5 Inches. • Blade Length: 3.625 Inches. • Blade Thickness: .125 Inches. • Knife Weight: 5.3 ounces. • Rockwell Hardness: 57-59 RC. L.T. Wright Handcrafted Knives is proud of our quality and we warranty all of our products to be free of defects for the life of the product. Skilled craftsmen, who take pride in their work, and intend for your knife to be handed down for generations, make our knives. We cannot warranty a knife against rust and we cannot warranty knives and sheaths against abuse or normal wear and tear. Overall Length: 7.5 Inches. Blade Length: 3.625 Inches. Blade Thickness: .125 Inches. Knife Weight: 5.3 ounces. Rockwell Hardness: 57-59 RC. If you have any questions about this product by LT Wright Handcrafted Knives, contact us by completing and submitting the form below. If you are looking for a specif part number, please include it with your message.